Trump: Democrats want immigrants to 'infest' U.S.
GOP Senate leaders said they were looking to work with Democrats to take action on the family separation issue as quickly as possible. WASHINGTON — President Donald Trump on Tuesday accused Democrats of encouraging undocumented immigrants to "infest" the United States as he escalated an already pitched defense of his policy of separating migrant children from their parents at the Mexican border. 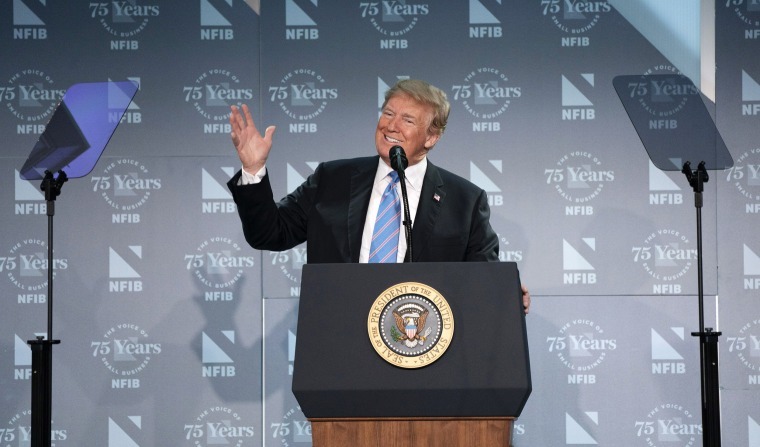 On Twitter and during a speech to the National Federation of Independent Businesses, Trump argued that his actions could be stopped if only Democrats would join with Republicans in Congress to adopt his favored changes to immigration law — including the construction of a border wall and limitations on legal immigration — in addition to outlawing his "zero tolerance" policy's separation of families. But GOP Senate leaders said Monday they were looking to work with Democrats to take action on the family separation issue, rather than a larger immigration measure, as quickly as possible. "Hopefully we’ll get this problem addressed right away," said Senate Majority Whip John Cornyn, R-Texas. "My hope is this is not going to be something that we’re going to do over a matter of weeks or months but something we could do in a matter of days, hopefully this week." Trump pressed his assault on Democrats Tuesday, portraying them as the only impediment to the immigration agenda he campaigned on. At the business event here, Trump said that while Democrats are necessary to legislating a solution to the border crisis, he also said they would like to allow immigrants to enter the country illegally. "We need Democrats' support. They don’t want to give it because Democrats love open borders," he said, contending that his political opponents favor letting gang members into the country. "They view that as potential voters. Someday they are going to vote for Democrats." The rhetoric echoed Trump's similarly false allegation that House Minority Leader Nancy Pelosi, D-Calif., "came out in favor of MS-13." Pelosi had objected to Trump calling some undocumented immigrants "animals" this year, a comment he said at the time was directed toward MS-13 gang members specifically and not other immigrants. But Trump's tweet Monday tagged MS-13 as a subset of illegal immigrants who he said "infest" the U.S.
Rep. Ileana Ros-Lehtinen, R-Fla., criticized Trump's language. "No, @POTUS, saying immigrants 'infest' our country is repugnant, reprehensible, + repulsive," she wrote on Twitter. "To dehumanize those who wish to make a better life for themselves + their families flies in the face of decency. The real infestation is only one of your baseless rhetoric." Earlier in the day, Trump claimed on Twitter that Democrats "don't care about crime and want illegal immigrants ... to pour into and infest" the United States. "Democrats are the problem," Trump said, hours before he was set to address Republicans on the Hill on immigration, again pushing the false notion that the opposition party is responsible for a practice his administration put in place. Trump began his morning tweetstorm with an attack on the federal probe into Russian election meddling before turning to the news of the day: the alleged dangers of allowing immigrants into the country and the purported necessity of separating families at the border. He doubled down on a false claim he tweeted Monday, that crime is up in Germany thanks to high rates of immigrants. German crime is at its lowest point since 1992, down 5 percent from 2016, and there is no evidence that Trump has some alternative unpublished crime data. Trump also declared that Congress must "change the ridiculous and obsolete laws on immigration. Get it done, always keeping in mind that we must have strong border security." Democrats have lobbied to end the Trump administration's policy of separating children and adults at the border, and many have accused the president of holding migrant children hostage to extort Congress for the money to pay for his long-promised border wall. But Trump also faces growing opposition from his own party and bipartisan consensus has been building to put a stop to the practice, though there is no clear legislative path forward. Many lawmakers in both parties have called on Trump to reverse the policy himself while Congress considers broader immigration legislation. Sen. Orrin Hatch, R-Utah, told NBC News on Tuesday that he is circulating a letter for Republican and Democratic senators to sign calling for Attorney General Jeff Sessions to halt family separations until Congress can act. Trump appeared to throw cold water on a bill developed by Sen. Ted Cruz, R-Texas, that would create facilities for holding families and add hundreds of administrative judges to vet asylum claims. "Ultimately we have to have a real border, not judges," Trump said. "Thousands and thousands of judges they want to hire — who are these people?" He also said he wants changes to the broader overhaul of immigration laws the House is slated to consider later this week, and suggested he'll leave a deal on the table if it doesn't address his priorities. The so-called compromise immigration bill crafted by House GOP leaders last week would require the Department of Homeland Security to house families together while parents are going through criminal proceedings for a misdemeanor of first-time illegal border crossing, a House Republican source familiar with the measure’s drafting said Tuesday. The source noted that this would represent a change from the current practice that leads to family separation. The source also said that the bill eliminates a 20-day cap on DHS administrative custody for accompanied children so that families will be kept together in DHS custody throughout the proceedings. The legislation, however, is still being finalized and an updated version is expected to be circulated Tuesday and discussed at the evening meeting with Trump. Senate Majority Leader Mitch McConnell, R-Ky., said at a press conference Tuesday that the entire GOP conference supports keeping families together, and that he will reach out to Democrats about crafting such a measure. Cornyn said he hoped the legislation will become a reality by the end of the week. Rep. Mark Meadows, R-N.C., the chairman of the Freedom Caucus, introduced a measure Tuesday that would end family separation but make it harder to seek asylum in the United States. Democrats are furious with the administration, with some calling for the resignation of DHS Secretary Kirstjen Nielsen who defended the zero tolerance policy Monday at a White House briefing. Democrats on the House Appropriations Committee are also calling on their GOP counterparts to hold a hearing on the administration’s use of federal funds to separate families at the border. Rebecca Shabad and Alex Moe contributed.